Tibetan villagers living in the southwestern Chinese province of Yunnan have marked the beginning of the Lunar New Year by vowing to give up the wearing of animal furs and by burning those already in their possession, sources said. The Feb. 27 action by residents of Drangsung village in Yunnan’s Dechen (in Chinese, Deqin) county was aimed at complying with the wishes of exiled Tibetan spiritual leader the Dalai Lama that Tibetans abandon the use of animal skins for clothes, a local source told RFA’s Tibetan Service. “The Tibetans had kept animal-skin clothes as rare and valuable family possessions,” RFA’s source said, speaking on condition of anonymity. 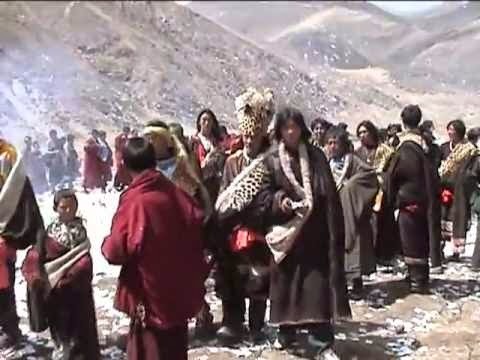 “So the Tibetans in Drangsung village came together and set their fox-fur caps and dresses decorated with wild animal skins on fire,” he said. The Dalai Lama first appealed in January 2006 to Tibetans living in China to protect endangered animals in Tibet and to stop using animal skins on their clothes, and many Tibetans heard his instructions via Tibetan radio broadcasts from overseas. Chinese police frequently investigate and arrest Tibetans deemed to have responded to the wishes and policy directives of the India-based Dalai Lama, whom Beijing considers a dangerous separatist bent on “splitting” Tibet from Chinese control. “The Tibetans were fully aware of the possible consequences of their actions, and knew they might be detained and beaten by the authorities,” RFA’s source said. Tibetan followers of Shugden, a controversial deity whose worship has been deemed divisive by the Dalai Lama, have increased their use of clothing dressed with animal furs, however, he said.